This gulet Nika 16 is a modern ketch design gulet, based in Corfu, Greece. 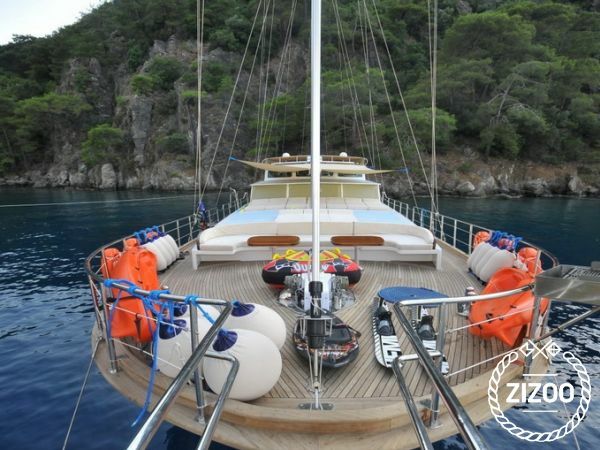 She is a 24 metres in length and a deluxe category gulet. She was built in 2013 and has 4 cabins, accommodating up to 9 guests comfortably, on board. There are two large and spacious master cabins, plus 1 double and 1 twin cabin all have private, well equipped bathrooms and are fully air conditioned. The large and spacious salon has a comfortable seating and dining area and is also air conditioned, providing TV, music system and internet access. The fore deck offers a very comfortable seating area and sunbed cushions, to enjoy the summer sun and wonderful views as you cruise along the coastline.The aft deck has a tenteddining area and a cushioned relaxation area. Water sports are on board and include, water skis, wake board, ringo, kayaks and fishing and snorkelling equipment. The captain and crew will ensure your blue cruise on board Suitable for 2 families, or a mixed group Crewhas their own living and sleeping space.